The spot on the lunar surface where NASA intentionally crashed its twin gravity-mapping moon probes today (Dec. 17) has been named after the late Sally Ride, America's first woman in space. The two Grail probes, known as Ebb and Flow, slammed into a crater rim near the moon's north pole at 5:28 p.m. EST (2228 GMT) today. Their final resting place will bear the name of Sally Ride, who played a key role in Grail's education and outreach efforts, team members announced today. "The team very much wanted to honor her contributions to education by naming the impact sites after her," Grail mission principal investigator Maria Zuber of MIT said just minutes after the crash, in a live webcast aired by NASA TV. Ride had led Grail's MoonKAM project, which allowed schoolkids around the world to select lunar sites for Ebb and Flow to photograph. She died this past July at the age of 61, after a battle with pancreatic cancer. Ride is most famous for being the first American woman — and the third woman overall — to fly in space. She reached orbit in 1983 on the STS-7 mission of the space shuttle Challenger, then flew again on Challenger's STS-41G mission a year later. She spent a total of 343 hours in space. Ride's sister, the Rev. Bear Ride, was on hand at NASA's Jet Propulsion Laboratory in Pasadena, Calif. — which managed the Grail mission — for Ebb and Flow's last moments. She said the Ride family is excited about the honor. "We're so grateful to Maria and to the team for continuing this dream and making it such a complete success," Bear Ride said. "It's really cool to know that when you look up now at the moon, there's this little corner of the moon that's named after Sally. And we hope that kids will really be inspired by that as well." The $496 million Grail mission — short for Gravity Recovery And Interior Laboratory — launched in September 2011. 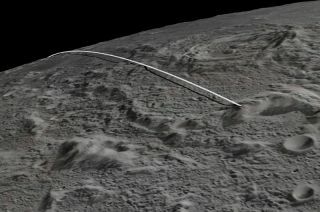 Ebb and Flow arrived at the moon about three months later, then raced around Earth's satellite in tandem, mapping out its gravity field in unprecedented detail. The probes' measurements have allowed scientists to create the best-ever gravity map of any celestial body, Zuber said. The twin spacecraft were running out of fuel and were bound to impact the moon at some point, so the Grail team brought them down today in a controlled fashion, away from the Apollo program's landing sites and other areas of historical importance on the moon.